Add the finishing touch to all those quilted Christmas gifts with a unique label! These labels are available in both color and line drawing, in a downloadable PDF file. 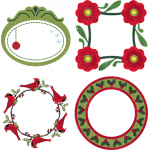 Add the finishing touch to all those quilted Christmas gifts with a unique label!These labels are av..